We didn’t make it to Cito Peak last September. Instead the Vacation Volunteers were redirected to a rush project – co-working with the Conservation Staff to punch through 3,300 feet of new trail to provide 2019 crews with more than one route into and out of Sawmill. Mission accomplished! Barring any new unforeseen priorities, the 2019 Volunteer Vacation will return to work on the Cito Peak Trail. The Philmont Staff Association and Philmont Scout Ranch are pleased to again offer this opportunity in 2019. This will be the 4th year for the very exciting and tremendously rewarding Volunteer Vacation. Past participants have experienced a fantastic week in the backcountry, hard physical work, and the ultimate satisfaction of giving back to Philmont. The dates are September 14 to 21, 2019. The cost is only $225. Registration opens March 1, 2019 at noon, Mountain Time. Registration deadline is August 15th, 2019. Please see Registration, Payments, and Refunds at the end of this article. The Volunteer Vacation in 2019 will continue with the construction of a new spur trail to the top of Cimarroncito Peak. Workers will push closer to the summit. This spur trail connects to the new Cyphers Mine / Thunder Ridge Trail, recently constructed in the area. These trails are helping to open a seldom used part of Philmont essential in the aftermath of the 2018 fire. There has never been a trail to Cito Peak. Your work will be instrumental in making this happen. The full Philmont medical form is required – the same 7 page form required for summer Trekkers. Please note, just because your doctor certifies you, it does not mean this program is for you. Volunteer Vacation requires hard work, long hours, a good crew spirit, backpacking ability and a sense of humor. This program is not leisurely and is not for those who are afraid of sore muscles, getting dirty, and who cannot maintain a great attitude when the going gets tough. The PSA reserves the right to return the entire registration fee of any person who would be inappropriate for this program. Here’s the tentative schedule for the 2019 PSA Volunteer Vacation. Please note, this entire schedule could change dramatically based on Philmont’s needs. We’ll keep everyone informed as the year progresses. Final wrap-up of trail construction work, break camp, clean up the Whistle Punk campsite, and then hike or ride to another campsite. The final campsite will depend on the number of participants, availability of transportation vehicles, weather, etc. Volunteers will spend the night at this new location, relaxing and enjoying traditional Philmont camping. In the morning, possible side-hikes based on the location. By midday or early afternoon, Volunteers will be transported back to Base Camp. Friday evening’s dinner will be a celebration of the week and recognition for what you have given back to Philmont. Participants will be awarded the coveted Volunteer Vacation patch. Download the detailed High Country article from 2016 providing a full explanation of everything that takes place. Philmont will pre-stage food, tools, and all crew equipment at Whistle Punk. However, the unused room in your pack will need to be filled with extra (and heavier) work clothes along with warm clothes (jackets, gloves, long underwear, headgear, etc). Extra gear can be shipped back to Base Camp after trail work is completed, but you will then be carrying traditional crew gear and food when hiking to your campsite on Thursday. Philmont backpacks are available at no charge if needed. Do we need a tent? You will be sleeping in normal backpacking tents for 5 of your 7 nights at Philmont. You can bring your own tent or use the standard issue Philmont Thunder Ridge 2-person tent (no charge). Tent pairings and partners will be discussed as the participant list is completed. Whistle Punk is almost 10,032 feet, and by September 15th, autumn will be setting in. You will need warm clothes and a warm sleeping bag. Philmont would like to work with a group of 24 to 30 volunteers. If we exceed that number, a wait list will be established. In the memo, please write: "728-PSA 2019", “PSA Volunteer Vacation”, "PSA Autumn Adventure" or whatever your event name is. Philmont’s refund policy: ALL FEES ARE NON-REFUNDABLE. THEY CANNOT BE APPLIED TO FUTURE PSA TREKS OR EVENTS. Emergency situations will be handled by Philmont (not the PSA) on an individual basis. Even before the devastating Ute Park Fire was finally extinguished, PSA members began asking how they could help. Many contributed to the Fire Recovery Fund, but others wanted to provide hands-on assistance. They wanted to be on-site and help heal the land they love. Philmont and the PSA are excited to offer PhilBreak 2019. This event will consist of a full week’s work restoring Philmont’s burned and unburned forests. Actual work will include slope stabilization projects, such as log erosion barrier and wattle installation, re-vegetation and forest thinning. By March 2019, the Conservation Department will have the exact details and locations ready to go. These are heavily dependent on the weather and road conditions. Only 30 slots will be open to registration. The dates are March 2–9, 2019. The cost is only $210. Registration opens online December 5th, 2018 at noon, Mountain Time. The registration deadline is February 15th, 2019. Please see the Registration and Cancellation Policies at the end of this article. Lodging for the entire week will be roofed housing at the PTC. Participants will be transported to the worksite every day. Breakfast and dinner will be at the PTC dining hall with trail lunches provided at the worksite. Participants are required to be registered with the BSA. The full Philmont medical form with your doctor’s approval is required. Please note, just because your doctor certifies you, it does not mean this program is for you. This PhilBreak program will require hard work, long hours, good crew spirit, and a sense of humor. This program is not leisurely. The PSA reserves the right to return the entire registration fee of any person who would be inappropriate for this program. Saturday, March 2: Arrive at Philmont during the day. You must arrive by 5 PM MST. No late arrivals will be allowed. If you cannot arrive by 5PM, then you should plan on arriving on Friday, March 1st and stay in Cimarron, Taos, Raton, etc. The first Philmont provided meal will be dinner in the PTC Dining Hall. In the evening, the Conservation Department will begin the program with introductions and specific plans, gear info, advice, and general Q&A. Sunday, March 3: Medical recheck, finalize plans, and eventual transport to the fire area / worksite to begin work. Approximately one-half day’s work. Breakfast and dinner at the PTC. Trail lunch in the field. Monday, March 4 through Friday, March 8: Daily transport to the fire area / worksite (A shorter work-day on Friday). Breakfast and dinner at the PTC. Trail lunch in the field. Friday evening, March 8: Recognition dinner and final gathering. Saturday, March 9: Depart Philmont after breakfast. Are we camping? No. We will spend all nights at the PTC and stay in roofed housing. You will share rooms with other Phil-breakers. We will be transported daily to the worksite. Do we need a pack? Yes – a good-sized day pack or small weekend pack. Every day you will be driven to the worksite, but you’ll need to carry a trail lunch, lots of water (4-6 liters), rain gear, extra warm clothing (think layers), camera, etc. Will it be cold? Probably. This is the Backcountry in early March at 8,000 – 9,000 feet. Plan on layers for your clothing. Where will we be working? In the Backcountry burn area. It’s too early right now for the Conservation to pinpoint exactly where we’ll be working. Are there multiple PhilBreak sessions? There is only one (1) PSA PhilBreak session this year. There will be three (3) OA PhilBreak sessions later in March. Can a spouse or other family member hang out at the PTC while I work every day? No. What happens if 30 people register before me? We will put you on a wait list. Cancellations are inevitable. 30 slots will be filled in the order that registrations are received. The slots will be filled according to the date and time an electronic registration is received. If registering by mail, the date and time of receipt by the PSA office. If you call in your registration, the date and time of that call. Postmarks earlier than December 5, 2018, or dial-in registrations prior to noon Central Time on December 5, 2018, will not be accepted. Cancellation date: Friday, February 15, 2019. Simple Question—What’s the very best deal today that allows you to spend 7 days at Philmont and, at the same time, truly give back to Philmont? Obvious Answer—The PSA Volunteer Vacation! The Philmont Staff Association and Philmont Scout Ranch are pleased to again offer this opportunity in 2018. This will be the 3rd year for the very exciting and tremendously rewarding Volunteer Vacation. This program has sold out every year. Past participants have experienced a fantastic week in the backcountry, hard physical work, and the ultimate satisfaction of giving back to Philmont. The dates are September 15 to 22, 2018. The cost is still only $210. Registration opens March 1, 2018 at noon, Central Time. Registration deadline is August 15th, 2018. Please see the registration and cancellation policies at the end of this article. 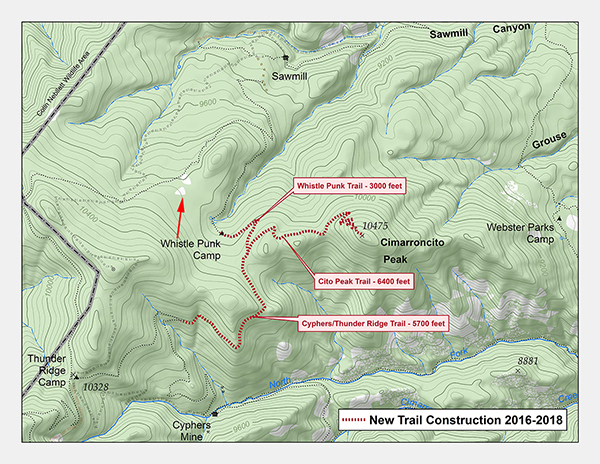 The Volunteer Vacation in 2018 will continue with the construction of a new spur trail to the top of Cimarroncito Peak. Workers will push closer to the summit. This spur trail connects to the new Cyphers Mine/Thunder Ridge Trail, also being constructed in the area. These trails are helping to open a little used part of Philmont and also aid the popular 7-day treks. There has never been a trail to Cito Peak. Your work will be instrumental in making this happen. This year’s program will be very similar to 2016 and 2017. Here’s a detailed article from 2016 providing a full explanation of everything that takes place. Both years, participant feedback has been excellent. “Hard work” “Pride” “Satisfaction” “Best ever” “Very physical” “Will return” are continually repeated in the evaluations. The full Philmont medical form is required – the same seven page form required for summer Trekkers. Please note, just because your doctor certifies you, it does not mean this program is for you. Volunteer Vacation requires hard work, long hours, a good crew spirit, backpacking ability and a sense of humor. This program is not leisurely and is not for those who are afraid of sore muscles, getting dirty, and who cannot maintain a great attitude when the going gets tough. The PSA reserves the right to return the entire registration fee of any person who would be inappropriate for this program. Probably. Whistle Punk is almost 10,032 feet, and by September 15th, autumn will be setting in. You will need warm clothes and a warm sleeping bag. What happens if 24 persons register before me?